VATICAN CITY (CNS) — A priest is called to be in the midst of his flock, protecting his people, searching for those who are lost and always serving those in need, Pope Francis told the world’s priests. If a priest wants to overcome those inevitable moments of sadness, exhaustion and boredom as well as discover his true identity, he must head for the exit sign, going outside himself to be with God and his people, he said April 17 during the chrism Mass in St. Peter’s Basilica. He must also be a dutiful servant who listens to people’s need and builds a church whose doors are wide open, offering refuge for sinners, a home for the homeless, comfort for the sick and God’s word and joy for the young, he said. 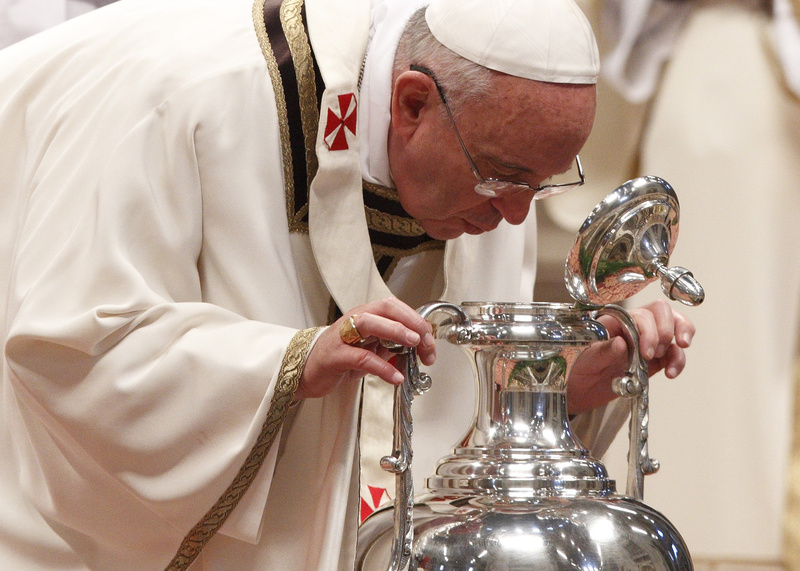 Presiding over the first of two Holy Thursday liturgies, Pope Francis blessed the oils that will be used in the sacraments of baptism, confirmation, ordination and the anointing of the sick. Deacons carried the sacramental oils in large silver urns to the main altar to be blessed by the pope. 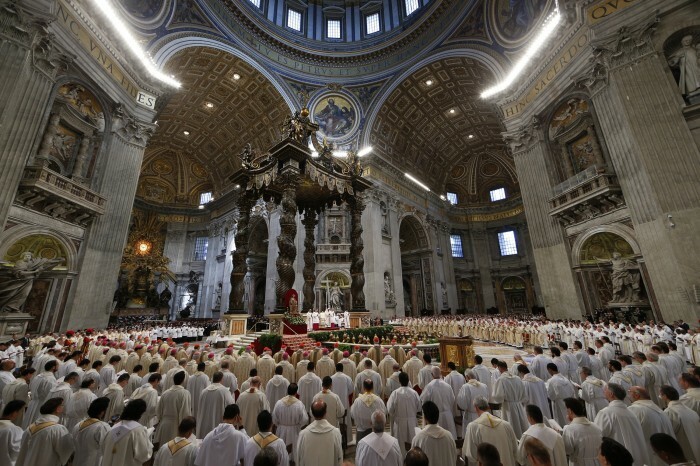 Joined by more than 1,500 priests, bishops and cardinals, Pope Francis led them in a renewal of their priestly vows and a reflection on what it means to be a priest, in a homily that was lengthier than usual. “Priestly joy is a priceless treasure, not only for the priest himself but for the entire faithful people of God,” the pope said. He said it’s not an exaggeration, given the “grandeur of the gift granted us” to minister and serve, to say the priest is a very small person. While “in that littleness we find our joy,” he said, being “little” without God spells danger. Priestly joy must be sought and rooted in God’s love and it can find protection from evil in prayer to Mary, he said. Otherwise a priest risks becoming “the poorest of men unless Jesus enriches him by his poverty, the most useless of servants unless Jesus calls him his friend, the most ignorant of men unless Jesus patiently teaches him as he did Peter, the frailest of Christians,” unless Jesus gives him strength in the midst of his flock, he said. Nor should the priest be trying to carve out his own identity because “there is no identity — and consequently joy of life — without an active and unwavering sense of belonging to God’s faithful people,” he said. The people of God “will make you feel and taste who you are,” he said. They will also be able “to protect you, to embrace you and to help you open your heart to find renewed joy” during those moments a priest finds himself feeling isolated, gloomy, listless and bored, “which at times overcome us in our priestly life and which I too have experienced,” the pope said. Like an attentive servant, the priest “makes the church a house with open doors, a refuge for sinners, a home for people living on the street, a place of loving care for the sick, a camp for the young, a classroom for catechizing children,” he said. The priest must be wherever there are people in need or searching; he needs to know how to listen, and feel driven by Christ to lift burdens with mercy and encourage hope with charity. Later in the day, the pope was scheduled to celebrate the Holy Thursday Mass of the Lord’s Supper at a Rome rehabilitation facility for the elderly and people with disabilities. He also was going to wash the feet of four women and eight men with different disabilities and ranging in ages from 16 to 86. Of the 12 chosen, nine are Italian, one woman is from Ethiopia, one young man is from Cape Verde and one man from Libya is Muslim, according to organizers.